Years ago, Michael Jordan established himself as a dogged competitor that didn’t mind how many bridges he burned or feelings he hurt on his way to getting what he wants. The latest news about the six-time champion and Basketball Hall of Famer, though, is a bit of a low point. In layman’s terms, he’s suing a grocery chain that dared congratulate him in an advertisement that also sold a few steaks. Jordan appeared in court this week to attempt to prove why such a lawsuit is necessary. Michael Jordan, because he’s Michael Jordan, somehow found out about this and was infuriated enough to initiate a lawsuit against Dominick’s for $5 million. Luckily, thus far, the suit has just about been laughed out of federal court. Jordan was allowed to avoid attention Wednesday by entering the Dirksen U.S. Courthouse through its underground parking garage and then taking a private elevator to U.S. District Judge Milton Shadur's 23rd-floor courtroom. Shadur, who has ruled that Dominick's is liable for a 2009 magazine advertisement that used Jordan's name without permission, wanted the owner of the Charlotte Bobcats to appear in person to hear the judge's views on what reasonable damages would be, according to court transcripts. He rejected a demand from Jordan's attorney that the president of the grocery chain also appear. "I think it would be a constructive use of time to see whether some element of sanity cannot be introduced into this matter," Shadur was quoted as saying in a transcript of a May 22 hearing. "I thought the demand was greedy," Shadur said of Jordan, who is seeking $5 million in damages for a one-page ad that ran in a Sports Illustrated commemorative issue celebrating Jordan's induction into the Hall of Fame. Jordan was able to sneak into the courtroom after a legal battle pitched by MJ’s representation, hoping to keep the most prominent member of this lawsuit away from the proceedings. Shadur, in court testimony from May 22, asked Jordan’s lawyer if he was “allergic to the notion that he somehow ought to participate in a lawsuit that he brought?" Kind of liking this Judge Milton Shadur-guy, at this point. 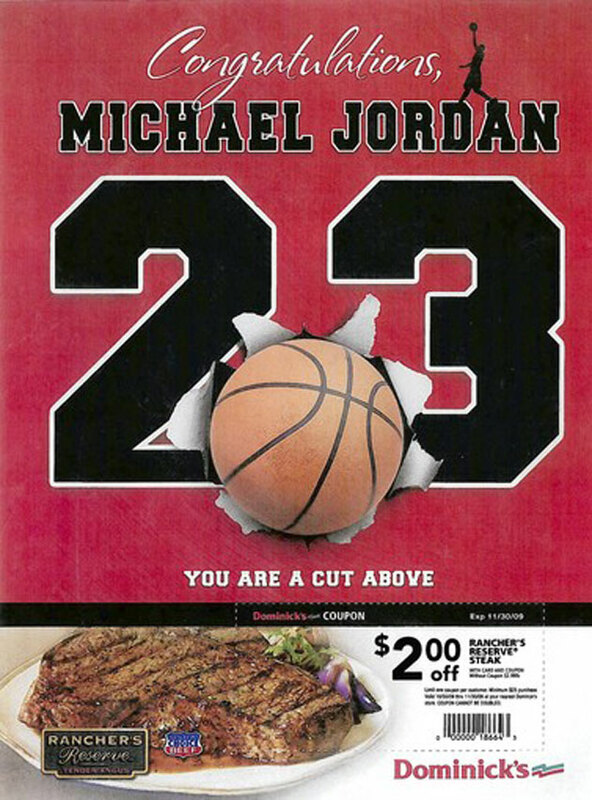 The judge hasn’t completely ruled out handing damages to Jordan, as Dominick’s (which is not just a mom and pop store, but the most prominent grocery chain in the Chicagoland area) clearly did use MJ’s occasion to make a band pun on cuts of steak in order to sell their wares. Jordan’s famous Jumpman logo wasn’t involved in the ad, nor were logos from the NBA, Chicago Bulls, or Charlotte Bobcats, but the company was piggybacking off of the eyeballs sent Jordan’s way in order to sell a few steaks as summer wound down in 2009. But for $5 million? 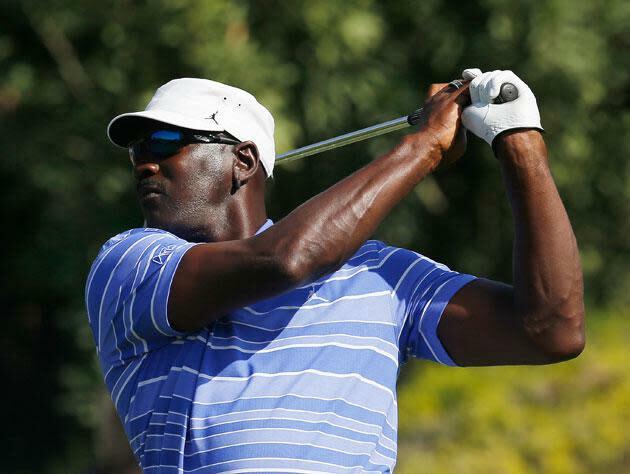 Just because that’s MJ’s current going rate? This wasn’t exactly a shoe company ad, destined to be seen by millions. Shadur has said Dominick's is liable for an advertisement that was "ultimately stupid and really totally without common sense," but the judge also held that Jordan has tried to make a "legal mountain" from a "legal molehill," according to transcripts. The case is ongoing. And pretty stupid, especially when you consider the fact that Michael Jordan was the guy that paid Ben Gordon $12.4 million to play basketball last year. • Chris Paul, Dwight Howard teaming up?